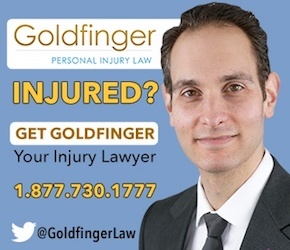 With meeting offices in Toronto, London, Peterborough, Kitchener-Waterloo and Owen Sound, the Goldfinger Law Firm has lawyers with the tenacity, experience, knowledge, and compassion to get the results you deserve for your personal injury or disability case. We act exclusively on behalf of seriously injured accident victims, long term disabilty claimants and their families. If you have been hurt or injured in a serious auto collision, slip and fall, dog bite, or catastrophic motor vehicle crash, you've visited the right website. 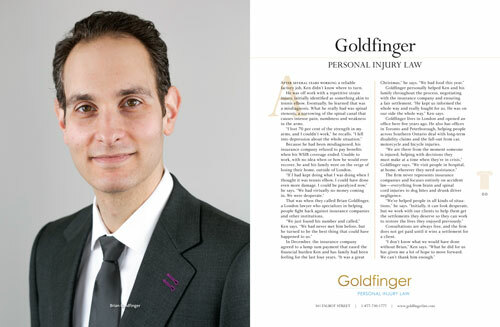 When Goldfinger Law was first established, we made a promise never to accept cases on behalf of insurance companies. We continue to honor that promise; something we take very seriously. Our law firm prides itself on standing up for, and fighting for the rights of the people, and seeing that our clients get the results which they deserve. As a result of our tenacity, hard work, skill, and commitment to excellence, our Toronto personal injury attorneys have built a reputation both inside and outside of the courtroom which has seen us recovery millions of dollars on behalf of our clients and their loved ones. Our knowledge and years of experience has taught us that every person, every case, and every legal battle is unique. Each case comes with it own challenges, twists and turns. Fortunately, we have proven time and time again that he have the skill and know how to get our clients and their families maximum results for their injury case to ensure peace of mind for years to come. Our practice areas encompass the complete gambit of accident law, from brain injuries, spinal cord injury, catastrophic car collisions, drunk driver negligence, motorcycle/bike crashes, fatality cases, pedestrian knock down cases, ankle fractures, dog bites and long term disability claims against large insurance companies . Our team does not practice in any other field outside of injury or accident law in Ontario. We focus our practice 100% on plaintiff side personal injury law. We have been chosen time and time again as the source which professionals, doctors, rehabilitation workers and other lawyers turn to when seeking legal advice in this field. Goldfinger Law has the ability to serve clients across Ontario. If you can't make it to one of our three office locations, then one of our lawyers will be happy to visit you at your home, hospital, at a rehabilitation facility, or anywhere else convenient for you. All of our consultations are free, and we guarantee not to charge you any legal fees until your case settles. If our law firm doesn't get you any money from your injury or disability case, then we don't charge any legal fees. That's called the Goldfinger No Fee Guarantee, and that's our commitment to every single one of our clients. It's that simple, and that straight forward. We like to keep it that way, and our clients appreciate that. If English is not your first language, or you have problems understanding or communicating in English, then we have plenty people here at our office who will likely be able to communicate with you in your language. Check out all of the languages spoken at our office here. If you're visiting this website for the first time, then we know how difficult finding a good Toronto personal injury lawyer can be. We know this can be a scary and difficult time for you and your family. You likely have a million and one questions, but don't know where to turn, and don't know what to expect. We have no doubt that this will be your one stop for all of the information, comfort, support and legal advice which you will need throughout your journey. Want to learn how car collision cases work in Ontario? No problem. Order the Goldfinger Guide to Fair Compensation free of charge. Have you or a loved one sustained a brain injury and you're looking for a source for rehabilitation information and what to expect following the trauma? We have that covered too in "Headstrong: The Goldfinger Guide To Understanding Brain Injury". Both Guides were written by our team, and have been published and distributed by hospitals, doctors and rehabilitation clinics throughout the province. Want up to date legal news and headlines from the Financial Services Commission and the License Appeals Tribunal? Check out our Blog which provides the most current updates. If you're looking for a lawyer to handle your injury or disability case, then you've come to the right place. Contact us for your free consultation, and we would be pleased to assist you any way that we can. We look forward to serving you, and helping you along your road to recovery to ensure that you get the results and compensation which you and your family deserve.